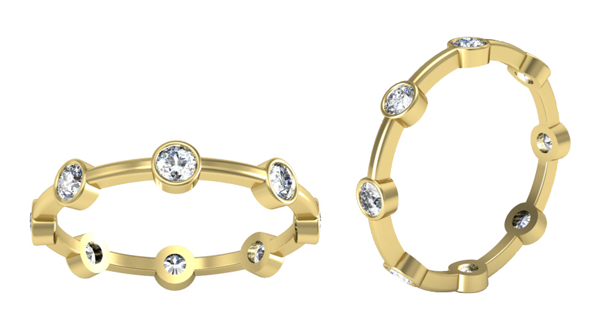 Stackable eternity rings have become popular fashion accessories for women. They allow a woman to mix and match different setting styles, metal types, and diamond and gemstone options to fit their mood or to complement a particular outfit. One of the best types of eternity band styles that are ideal for stacking are bezel set eternity rings. A bezel set eternity ring is one of the most secure styles, which is perfect for wearing next to another ring. 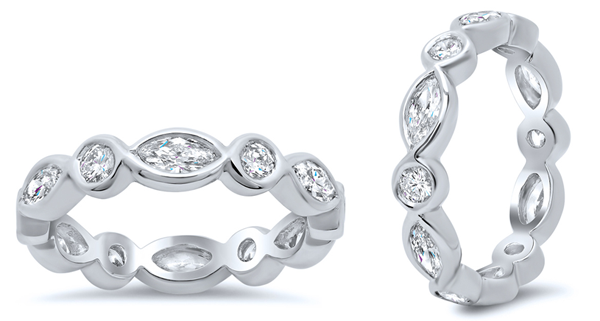 These designs are modern, fun, and add a beautiful amount of sparkle to a bridal set or an eternity ring stack. Below are my favorite bezel set diamond eternity rings that are offered by deBebians. This ring is quickly becoming one of the favorite eternity rings that we carry. 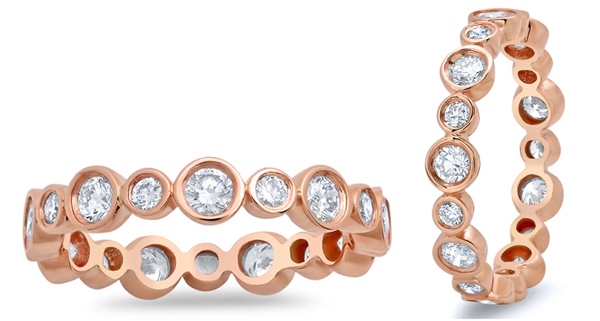 Shown here in rose gold, this ring features bezel set round brilliant cut diamonds that are alternating in size. This ring is bubbly and will be a wonderful addition to any woman’s jewelry collection. This contemporary design features both marquise cut diamonds and round brilliant cut diamonds. The varying diamond shapes make this ring a stunning option that will stand out if worn alone or next to additional rings. This ring is one of our newest eternity band designs. Shown in yellow gold, it showcases bezel set round brilliant cut diamonds and has a classic 2.7mm width. The diamonds are spaced equidistant apart. We have a huge collection of diamond eternity rings that are perfect for stacking. For some eternity ring inspiration, please visit our recently purchased eternity rings page.